Food. Drink. And all the things! Yes, this pancake hack that everyone's been talking about actually works. Simply whisk together your pancake mix, egg and water in your rice cooker and flip the on switch. It's shockingly easy to cure fish for lox. Here, let me show you how! All you need is some salmon, salt, sugar, pepper, dill and vodka. Admittedly, I was more curious about than salivating over these vegan, gluten-free waffles. But they were... yummy. Ever so slightly crispy and totally, completely fluffy, I'm thrilled there's a healthy substitute that I'd actually crave. We don't really have seasons in California. As much as I do love that, I sometimes yearn for colder weather -- an excuse to stay in inside to bake. There's something about staying in when it's cold outside with your oven fired up and your kitchen filling with the smell of baked scones. Omega-3 fatty acids: These "good fats" are good for your heart. 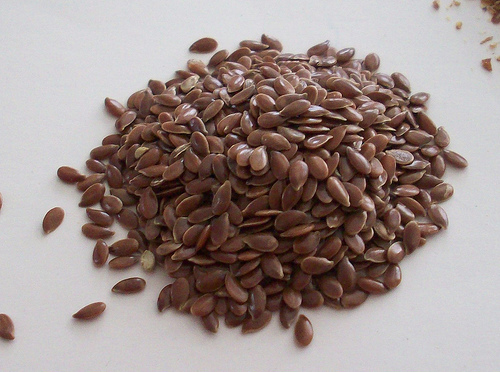 1 tablespoon of ground flaxseed contains about 1.8 grams of plant omega-3s. Fiber: It offers both the soluble and insoluble types, so it's good for digestive health. Antioxidants: The seeds contain lignans, which have estrogen and antioxidant qualities. Lignans help fight free radicals, which can damage tissue. Breakfast: Add a tablespoon of ground (or whole) flaxseed to your morning cereal or to yogurt. Lunch: Add a teaspoon of it to your sandwich spread, like mayonnaise or mustard. 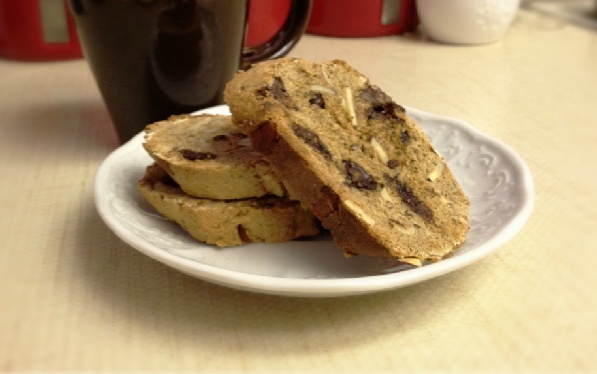 Baked goods: Add two tablespoons to any bread or muffin recipe. Aside form texture, the flaxseeds add an extra richness or thickness to your finished treat. Flaxseed photo by Flickr user Alisha Vargas. 2. Combine flour, flaxseed, baking soda, and salt in a bowl, stirring with a whisk. Using a mixer, combine sugars, egg whites, and egg in a bowl, and beat at high speed for 2 minutes. Add vanilla and almond extracts. Add the dry mixture (flour, flaxseed, etc.) to sugar-egg mixture; stir until combined. Fold in chocolate and almonds. 3. Divide dough into 3 equal portions. Roll each portion into a 6-inch-long roll. Arrange rolls 3 inches apart on a baking sheet lined with a silicon baking mat or parchment paper. Bake at 350° for 22-25 minutes or until firm and light golden brown. 4. Remove rolls from baking sheet; cool 10 minutes on a wire rack or separate plate. Using a serrated knife, cut rolls diagonally into 30 (1/2-inch) slices. Place back onto the baking sheet, cut sides down. 5. Bake at 350° for 5-6 minutes, turn cookies over, then bake additional 5-6 minutes. Cookies should be slightly soft in center. Remove from baking sheet; cool on wire rack or separate plate. Cookies will harden when they cool. My Notes: Why use a serrated knife? This is especially important because the sharpness of a serrated knife easily cuts through the crunchy but yielding cookie loaf. You need only very little pressure to slice through. If you used a chef's knife (yes, even a sharp one), you'd have to exert more force and run the risk of crumbling the cookies. Why use almond extract? The whole wheat and flaxseed are enough to overwhelm the nutty flavor, so adding a bit of extract livens it up. If you don't have almond extract, try 2-2.5 teaspoons vanilla extract. Whole or sliced almonds? The original recipe seems to call for whole almonds, but I find them to be unwieldy in such a small cookie. Sliced almonds are not only easier to eat, but easier to fold into the dough. Why change the baking temperature? I chose not to lower the temperature when I baked the cookies the second time because I wanted to ensure a crispy, crunchy texture -- not a stale one. Lower temperatures mean slower cooking time, which gives the dough more time to cook slowly and softly. 1. Prepare the vinaigrette: Finely chop the garlic cloves. Whisk in with red wine vinegar and Dijon mustard. Slowly stream in the olive oil, whisking throughout. 2. Wash and trim the spinach. Wash endive and pluck the leaves from stalks. Season the greens with salt and set aside. 3. Start boiling water to poach egg. 4. Cut up the slices bacon and saute in 2 teaspoons olive oil, until colored. Set aside on a paper towel. 5. Remove pan from heat and let cool about 1 minute. Do not throw out fat. Add vinaigrette, mixing with the fat. Add spinach and endive to the pan, tossing well into the dressing. 6. Poach the egg: When water comes to a boil (some bubbling at the surface) add 2 teaspoons white vinegar and turn down heat to a low simmer. Crack egg and gently open just over the water (so as to avoid splashing). Or, crack the egg into a separate small dish and pour into simmering water. Let cook just until egg white is set, about 3-4 minutes. 7. Mound spinach and endive on a plate. Sprinkle bacon bits on top, then set the poached egg on top. My Notes Why should I keep the fat in the pan? Because bacon is delicious! The fat rendered from this salty pork product is a flavor that mixes with the vinaigrette well. Plus, that meaty kick is then incorporated throughout your entire salad. Why so little Dijon? Why even bother adding the mustard if it's so little? Well, the Dijon acts as a binder to help the ingredients of the vinaigrette mix together better. And I'm a mustard fiend. It also helps mellow out the bright acidity of the red wine vinegar. Too much dressing? This recipe may yield a touch too much vinaigrette for your liking. I don't always use all of it. One good indicator of whether your salad is overdressed is making sure there isn't dressing pooling beneath your greens. This morning, on this hot summer day, I needed an ice cold pick-me-up. So I Googled iced coffee recipes and was surprised to see all the trouble people go through just for a glass of the caffeinated treat. People crush their own whole beans, strain them through a warm brew, and let the mixture sit overnight. No thanks -- when I want a cup of coffee, I want it immediately. I did a few more searches for an easy iced coffee, and I was more than pleased at the resulting drink I had ready in less than five minutes. 1. Add all ingredients -- except for the cinnamon -- in a cocktail shaker and shake well for several seconds, or until the mixture is well-combined and frothy. Pour over ice. If desired, add whipped cream and/or a sprinkle of cinnamon on top. My Notes: Why would I even have instant coffee? If you're a coffee snob, chances are you don't have a jar of the instant stuff tucked away into your cupboard. Ordinarily, I wouldn't drink it -- I just keep it stashed in my kitchen, reserved mainly for cooking and baking recipes. But because iced coffee is made primarily with cold milk instead of hot water, the strong, even bitter flavor of regularly brewed coffee isn't necessary. In fact, that bite probably isn't a taste you even want. Plus, chains like Starbucks use the instant stuff anyway -- so why bother paying those extra dollars for drinks you can easily make at home? What about different flavors? If you want sweeter coffee, add a dash extra sugar. If you want a thicker, milkier taste, try using 7 ounces cold milk and 1 ounce half-and-half. And of course, you can always nix the sugar entirely. Red velvet pancakes. Need I say more? Whenever I hear the words "red velvet" my ears instantly perk up. Cake? Cookies? And this time, pancakes? A friend of mine linked me to this recipe not too long ago and just by glancing at the ingredient list, I could tell this was a must-eat. So I zipped over to the grocery store and stocked up on the necessities. Even though many of the ingredients weren't already lurking in my kitchen, it was well worth it. It was easy to make and difficult to screw up. The end result is moist, fluffy and absolutely irresistible. I wish I could brag that I made all sorts of changes to the recipe, but I didn't change much at all. The full credit goes to a food blog called From Portland to Peonies. 1. In a large bowl whisk together the dry ingredients first. Add in the egg, buttermilk, sour cream, melted butter, red food coloring, and vanilla extract. Mix until combined. 2. Heat a frying pan or griddle over medium high heat. When hot add non-stick cooking spray, followed by a small scoop of the batter. Wait for the pancakes to bubble, about 2 minutes, flip and cook for a minute or two more. Top with a pat of butter and maple syrup, or whipped cream. My Notes: Creme fraiche or sour cream? If you're like me, you probably frequent grocery store chains like Ralph's or even Whole Foods. Creme fraiche can be hard to find, so I made these pancakes with sour cream -- and I wouldn't change a thing. More vanilla and baking soda: I love the fragrant, floral sweetness of vanilla, so in this recipe, I added a little dash extra. I also used extra baking powder to ensure a fluffy yet dense pancake. Make it dessert: A friend of mine declined the butter and decided to take this treat to the next level. Instead, he added a generous scoop of vanilla bean ice cream. Ice cream makes just about any food better, and these red velvet pancakes are definitely no exception. If you decided to go with ice cream topping, you may want to make your pancakes a tad smaller. The portions will be less filling and ultimately, less guilt-inducing! Where: Top Pot Doughnuts in downtown Seattle, WA. The Verdict: So what? They're just doughnuts. Ah, but often, it's the simpler foods that catch our eye. Certainly, unusual foods pique my interest, but when I hear about an ordinary dish that's served up in a memorable way, I do a double-take. You may have heard of Top Pot Doughnuts in the news recently; President Barack Obama stopped by in October and treated himself (and, I assume, his sizable entourage) to a few dozen doughnuts. The friendly staff at Top Pot revealed that the president himself enjoyed the Pumpkin Old-Fashioned Doughnut. That, indeed, was one of the establishment's better doughnuts, but my personal favorite was Old-Fashioned Glazed. It was simple, it was sweet and best of all, it packed that ever so slight resistance when I bit down. Sweet treats aside, another must-order is the Ovaltine Latte. I'm a big fan of both hot chocolate (when it's made correctly) and lattes. Top Pot fuses them together with this drink. With the sweetness of the chocolate and the kick of the coffee, you get the best of both worlds in this velvety drink.